Thanks Pete, but that doesn't sound like the name I used to remember- a much longer word I am thinking. 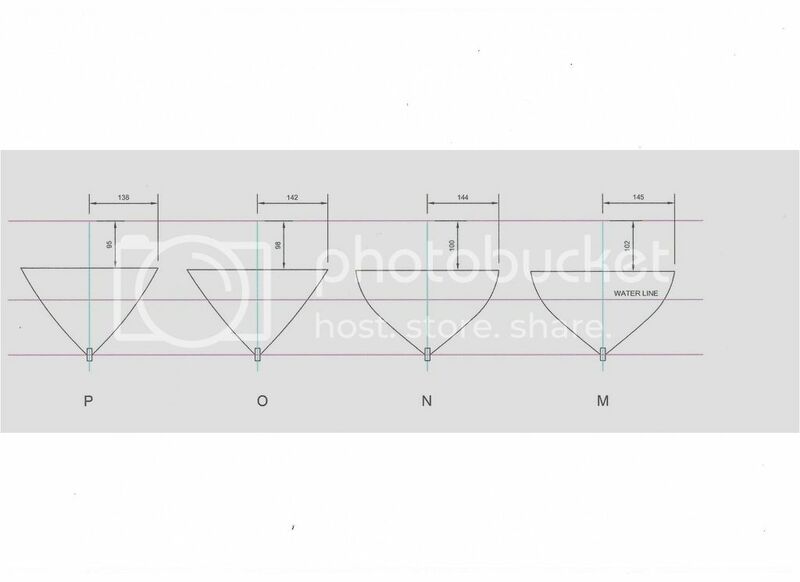 I have seen a few small images of the vessel lines you have created, however am unsure if the vessel beam...example Q>Q<Q is an actual simple dimensional flat deck beam/width or does it represent the narrower actual deck level beam due to the fore & aft rise of deck? Anyway food for thought maybe and I hope it helps just a little. Of course in your case there is no requirement to worry about the inner shape of each section as all the foam will dissapear when the glass work is complete and cured. There is a name for a smooth hull but it escapes at the moment. 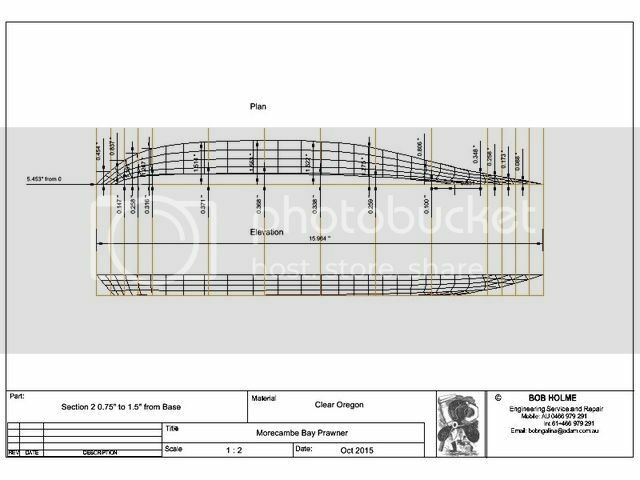 Regarding the hull profile I have drawn up a profile for each 50mm division/spacing. 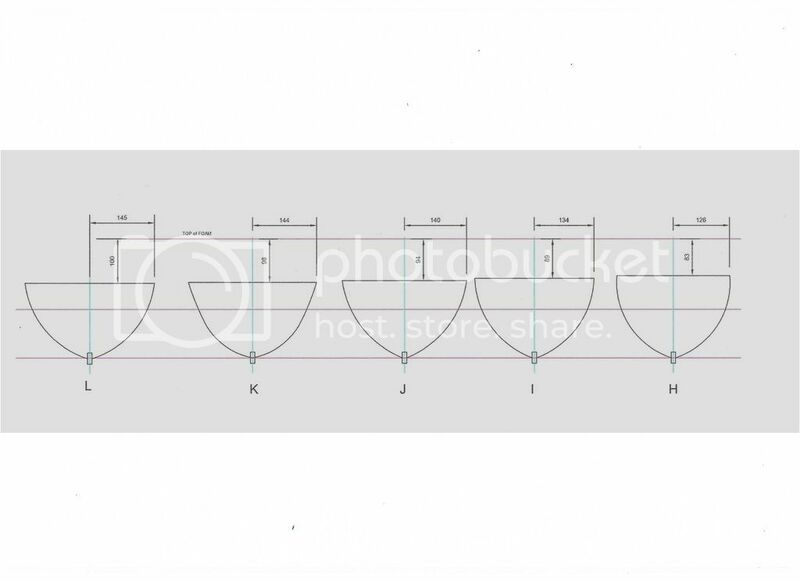 I will print out each profile (from B to U)full size and then cut out a cardboard template which I will use to obtain the correct shape in the foam. 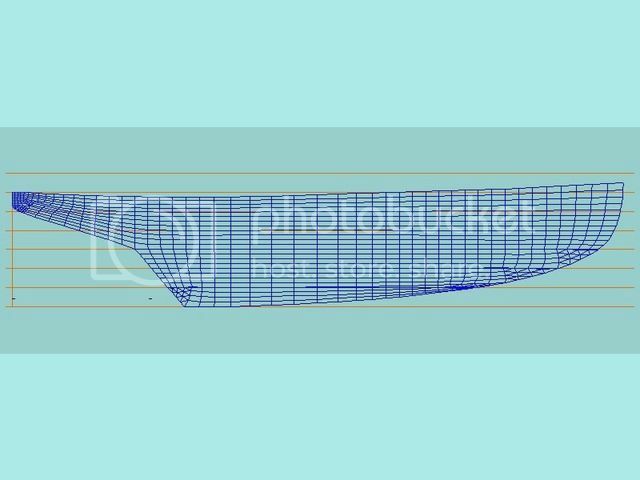 The profiles are just my thinking of how the shape should be, I only have photos of the prototype in the water so cannot see the lower portion. I have looked at other similar type boats on the net and used them as a guide. I am open to advice and suggestions. Too late now, but the last time I made a plug mold I cut out all those stations and laminated them into the foam block. Then just cut the foam down to the stations! WaaaLaaa! Looking at your profiles and layout I believe that what Derek was alluding to (post #31) is going to cause you some dimensional issues. 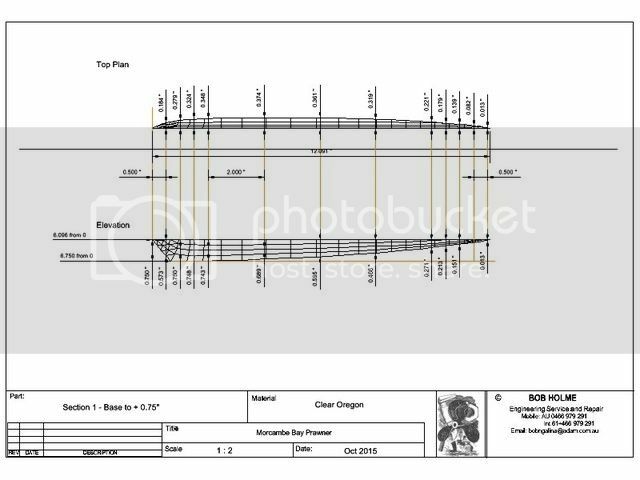 You have a deck plan laid out giving your dimensions across the beam at each station but the deck plan is flat and the same length as the transom to stem in the side elevation whereas it should be projected to take account of the sheer. As drawn your beam dimensions will be totally different at deck level given the curvature at each station. I also agree with Martin (MJM) in that the profiles should be much fuller particularly in the centre area of the hull. I assume you have laid these out to take account of your steam plant volume/footprint. Personally I would focus more on getting the shape fair and full to your eye than try to bring the foam to your templates - as someone who began (working!) life on a shipyard there was an old saying - "N'e'er were a boat built with two sides a like" You will be surprised just how close you will get by eye and if you felt that unsure it would be much better to shape one side and take a template from at each station and bring the other too it than to work to your templates which as you state are just your thinking of what they should look like. If you want to be really certain how your hull form will look before attacking that foam block. Cut all your templates from thick card adding on the height from deck level (the sheer) to a straight horizontal line above (as you have drawn). Stick them to a board on a centreline and then run some thin strip wood around to see how they fair. Pete has the right idea though - foam sections between card profiles. Shape the foam to just expose the card. But the profiles do need to be right and fair to begin with. Once again many thanks for the input gentlemen, I do appreciate the time and effort put into the comments and valued advice. I do see that the form needs to be fuller and will redraw with this in mind. It will also give the advantage of a lower floor line around the steam plant. The height of the bow some times looks quite high to me, I have a full side view of the prototype and from this scaled the deck shape. As the prototype was built for the Admiralty around 1890 I am assuming it was used for transporting naval officers from shore to ship when anchored off. The seas can be quite lumpy off shore around Plymouth / Portsmouth so a high prow would seem to be a sensible design to limit the egress of water. Another feature I am unsure off is the need to have a rudder support at its low point, i.e. an extension of the keel. I am presuming this would both provide support for the rudder and also some protection from hitting obstacles on the sea bottom. The section templates are good if you are pretty set on that shape. Otherwise just start carving that big block, a little at a time, and the shape you want will appear. Just remember that the foam is expendable and if you take off too much just glue in another piece! Let your inner sculptor out!!! I've always felt that a boat that size and weight should have a rudder shoe. A good solid extension of the keel shoe. I like the shear line on that boat in the picture. The trick with a high shear like that is to avoid a line that has a hog of any size forward. Sometimes a hogged line can appear from certain angles even though you don't see it in profile or plan. 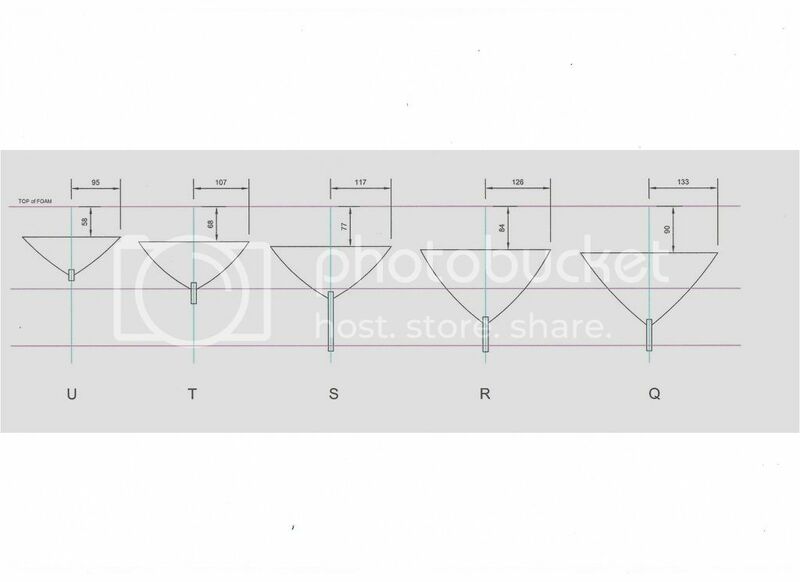 PS: I was just comparing the shear you have drawn vs. the photo. I think your drawing has a shear just a tad deeper than the photo...???? Sorry for the quick and dirty hull but I was only interested in illustrating camber from your side on photo. OK I have redrawn the profiles with more fullness, especially midships. Maybe I have gone a bit too far, I value comments here. I still cannot get my head around the concerns regarding the deck line sheer. The board I made is of course flat but it represents the plan view of the true deck line as seen from above. 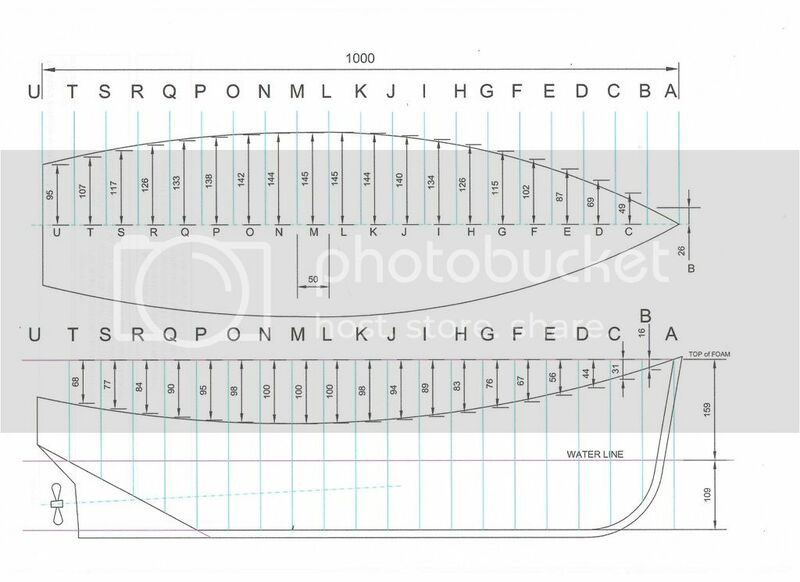 I understand the curved length of the deck line will be greater but do not see how that will be a problem for me. I propose to form the foam to the profiles as drawn up to the deck line. The beam width at the true deck line is 290mm. The fibre glass will be applied to just above that (say 10mm) and when the foam is all removed the glass will be trimmed to the correct deck line. Also considering I am only getting the shape as reasonably close to the photos and hopefully not subject to scrutinisation by the British Navy. I understand where you are coming from but for later on the transom at least should have a curved top or there will be an ugly gap and needless to say the reverse mold for the deck will have to be curved. Because sheer and beam are different at each station, the curves are therefore also different and not a constant. 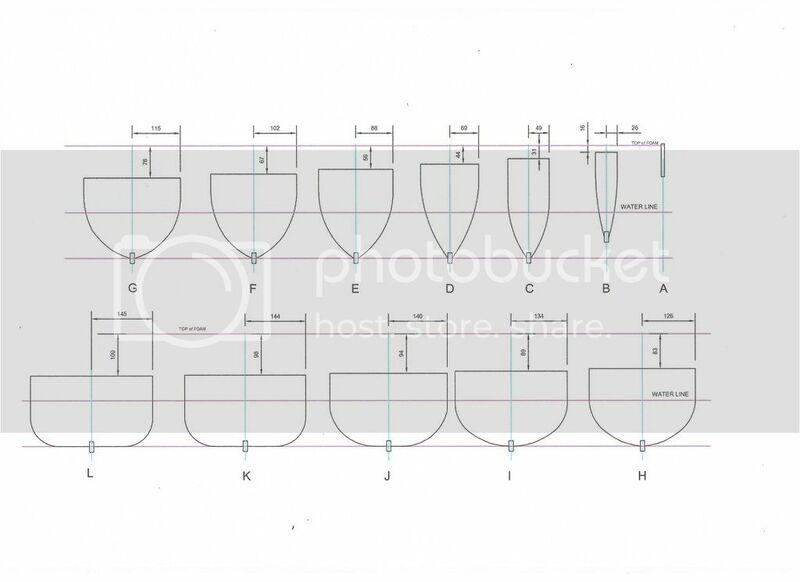 One of the hardest thing about wooden vessel hulls is to visualise the 3D hull in a 2D lines plan. 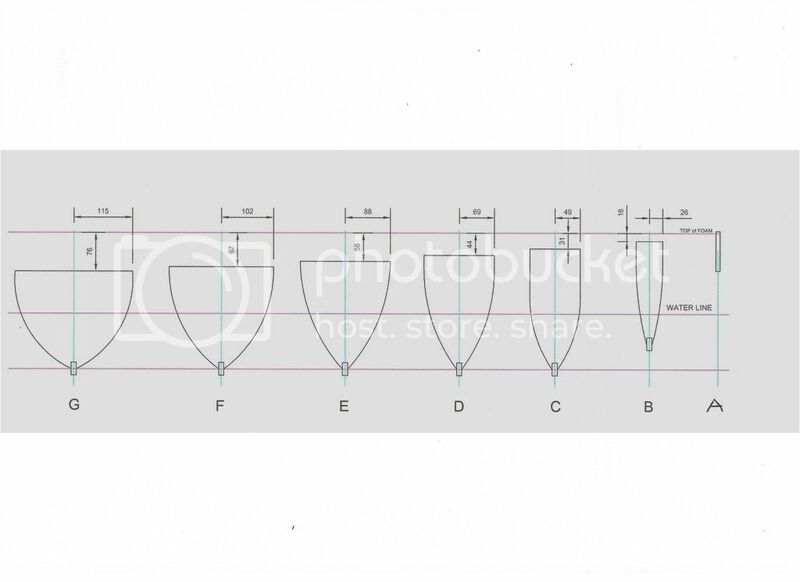 With most 19th century vessels every curve is either a spline or a bezier and there are vitually no straight lines vertically either side of midships. Here is a fantail 19th century launch if you look closely you will see no vertical sides with a very slight Tumblehome around the midships sections. Tumblehome meaning the hull slopes outwards from the deck line before reversing to curve inwards to the keel.